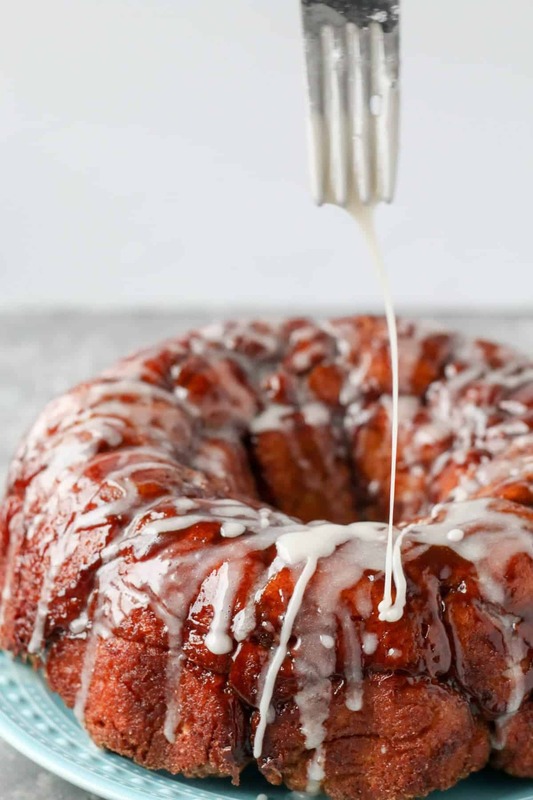 This Cinnamon Monkey Bread from scratch, is going to become your sinful go to brunch treat to wow the pants off your guests. Fluffy pull apart sweet bread rolls dipped in butter, rolled in cinnamon and sugar and drizzled with a vanilla glaze. 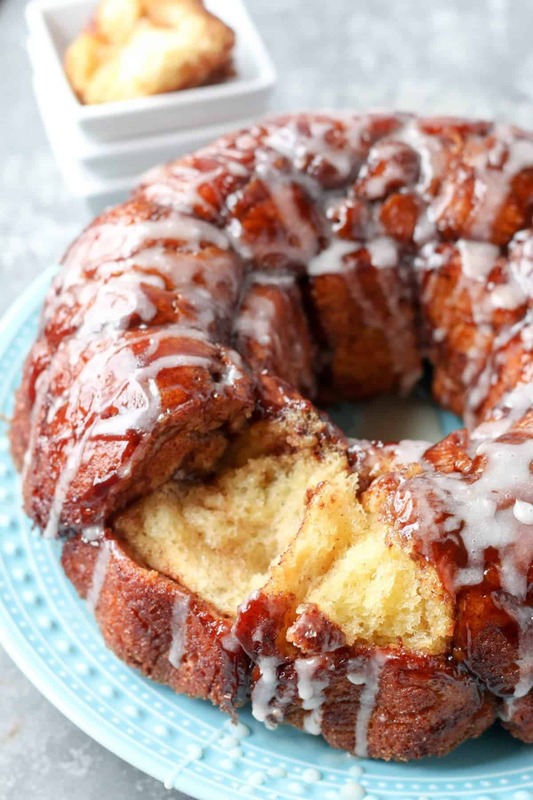 This monkey bread recipe from scratch is THE perfect brunch treat. All you need is now is a mimosa to wash it down with. Excuse me while I lick my fingers as I type. They are covered in brown sugar cinnamon buttery goodness. Believe it or not, when it comes to breakfast I’m a salty girl all the way. Bring on the crispy bacon. Everything bagels topped with a fried egg. Dripping in cheese as the yolk runs down my chin kind of salty girl. There are a few breakfasts that will make me stop dead in my tracks and put down that breakfast sandwich. Cinnamon monkey bread is one of them. Basically I love monkey bread. ‘Nuff said. This is a great recipe for Christmas morning, Easter brunch, or really any Sunday that calls for Mimosas and stretchy pants. A monkey bread recipe from scratch is worth all the trouble and then some. It’s kind of a goofy name right? 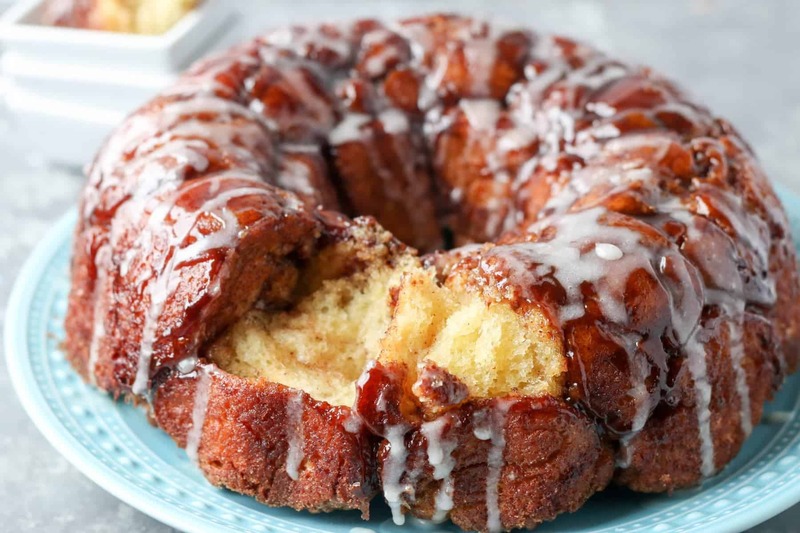 But monkey bread is a rich dough, a yeast bread, where the dough is divided into small balls of dough, rolled into usually a cinnamon sugar and baked into a bundt pan. And apparently it has to do with being a finger food. The idea is that you pull apart bread rolls and eat it like a monkey might do. Well Monkey see. Monkey do if you ask me. Now you can get store bought bread rolls or use biscuit dough, like my 6 ingredient overnight monkey bread or you can make it from scratch. I prefer making my monkey bread from scratch! Monkey bread does take some time to make when making it from scratch. 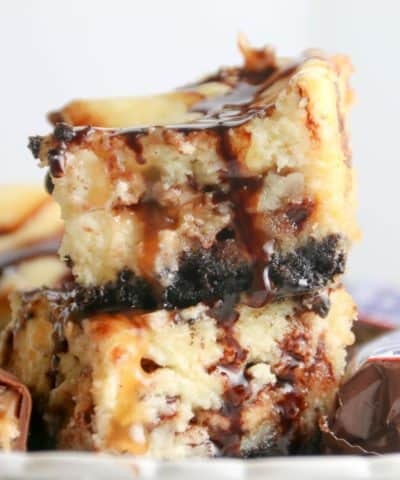 But it’s worth every single amazing bite. First off, yes we are going to need to work with yeast on this. Now I know there are easier ways to make monkey bread by using frozen bread dough. But this is not that kind of recipe. So yes yeast. Yes you can do it. And yes I’ll help you every step of the way. 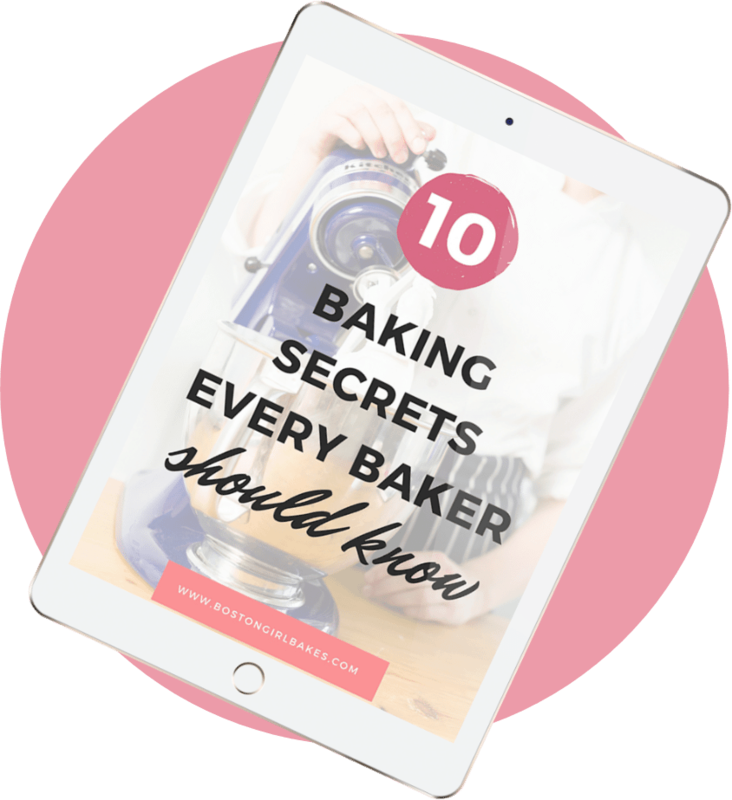 You might want to give my Ultimate Guide To Making Homemade Bread Recipes a read. 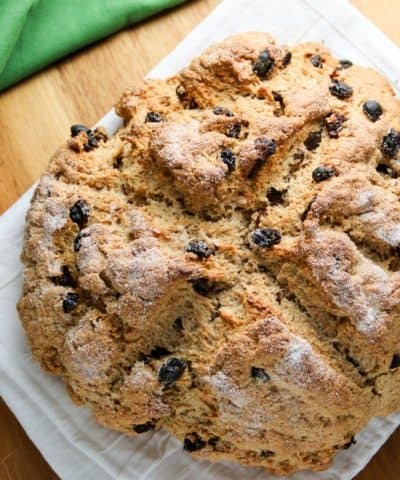 This recipe for the dough comes from Bake From Scratch. I recommend using Red Star Yeast if you can find it. It’s a premium yeast that will yield premium results. To make the dough, start by combining warm milk (I recommend using whole), sugar and your active dry yeast into the bowl of your stand mixer. You want to let the yeast proof for about 10 minutes until it’s foamy. Pro Tip: If the yeast doesn’t foam, your milk was either too hot or your yeast was expired. Check the dates and expiration and try again! 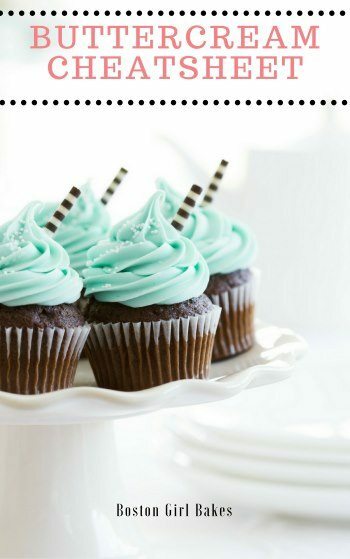 If you don’t have a stand mixer, don’t fret. You can knead your dough by hand. It will take some muscle and a few extra minutes, but it can be done. Check out how to knead dough from King Arthur Flour. To this you will add in 1 cup of your properly measured flour. Then some melted butter, more flour and then your eggs. Once the flour has been added its time to let the dough rise for about an hour in a greased covered bowl. Go do some dishes. Or Catch up on Netflix. Yea, I vote for Netflix too. Ok phase two: time to get your hands dirty. In one corner of the arena: cinnamon + brown sugar. And in the other corner. Always a crowd favorite. Butter. Basically get your bundt pan ready by spraying with non-stick cooking spray. Do I Need To Use A Bundt Pan? If you don’t have one, then don’t sweat it. You can bake your monkey bread in a casserole dish. 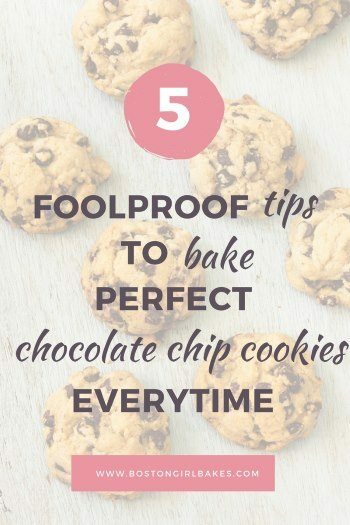 It will actually bake more evenly and faster anyway! Monkey bread made in a casserole dish will only take about 20 to 25 minutes. And then cut the dough into about 1-inch size balls of dough and roll them into a nice circle. You can divide the dough up and weigh each piece so they are even, or eye ball it. I eyeballed it. And it worked perfectly. Were they all the same size? Well no. But in the end you couldn’t tell. Then it’s time to dip! Dip first in melted butter, then roll in the brown sugar and cinnamon mixture. I recommend always unsalted butter, because different brands use different amounts of salt. So it can be hard to control. If you only have salted butter, then omit the salt from the recipe. 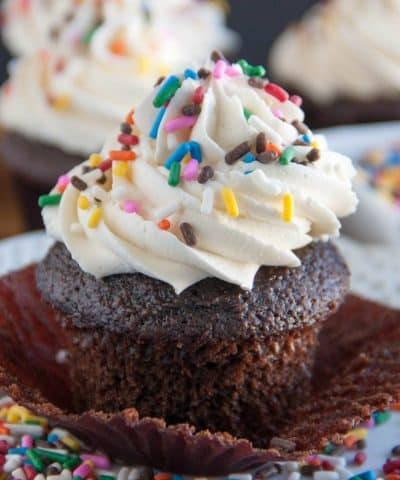 Place these around in your bundt pan. Don’t worry if it seems like you have open spots in the end where you can still see the bottom of your bundt pan. You are going to let the dough rise one more time again and before you know it you will have a entire pan filled with dough. Now before you get ahead of yourself and bake this cinnamon monkey bread, you should have some leftover brown sugar and butter. Don’t worry you didn’t measure wrong. That’s suppossed to happen. 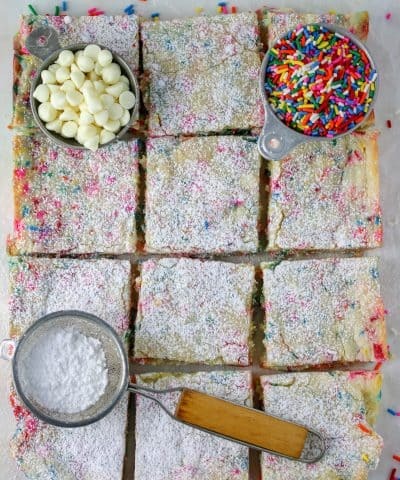 Simply combine what’s left and then drizzle that over your dough before baking. 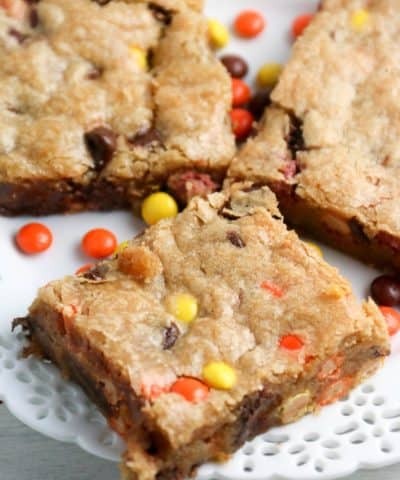 You should have about one cup left of mixture to drizzle. Unless you got seriously dip happy and used it all up. Then bake for about 30 to 35 minutes and allow it to cool in the pan for about 5 minutes before turning it upside down onto a plate. Of course then it’s time for the glaze…. 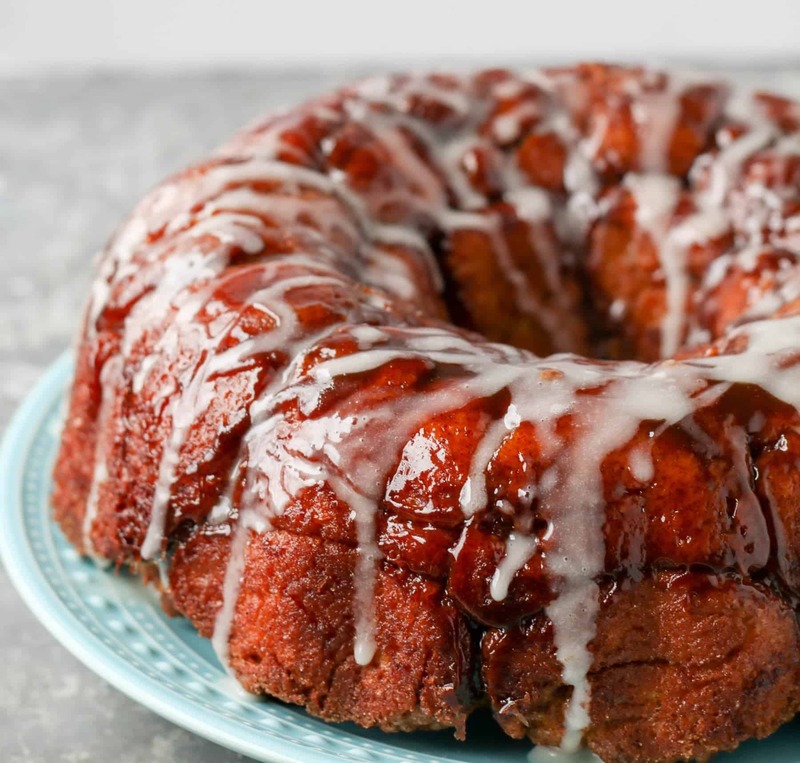 Do You Keep Monkey Bread In The Fridge? Shape the rolls and place in your bundt pan. Then cover with plastic wrap and store in the refrigerator overnight. And when ready to bake, uncover and allow to come to room tempearture and rise (the dough will get puffy) before baking. Can You Reheat Monkey Bread? If for some reason you actually have leftovers (can’t say I have had any!) but yes you can re-heat. According to LeafTV, you can store the leftovers in the refrigerator. I always recommended keeping them wrapped and protected from drying out and weird smells in your fridge getting to it. Then when ready to eat, you can warm the monkey bread back up in an 250°F oven. So monkey bread from scratch = basically, drizzle. Lick. Repeat. Pour a mimosa. Invite some friends over. And start pulling it apart. Oh then grab a slice of bacon too if you aren’t too stuffed full of this cinnamon monkey bread. If you love this homemade monkey bread recipe, let me know and leave me a star rating and comment below! 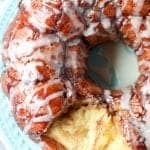 Pull-Apart Cinnamon Monkey Bread made from scratch and drizzled in a vanilla glaze! 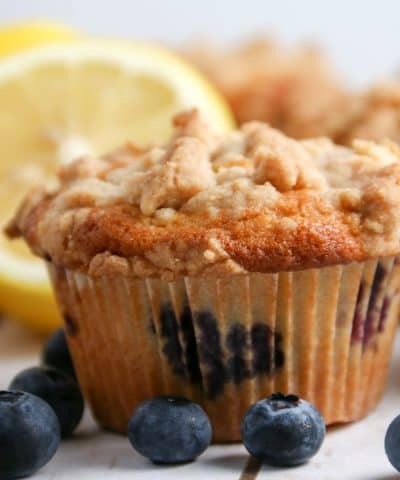 Perfect brunch treat! 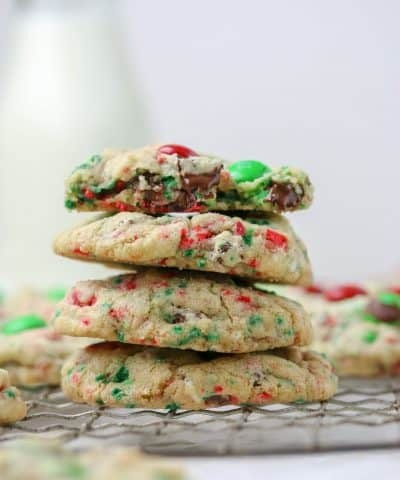 To Make The Dough: In the bowl of a stand mixer fitted with the paddle attachment, combine warm milk, sugar, and yeast. Let stand until mixture is foamy, about 10 minutes. To make the coating: In one small bowl, combine the brown sugar and cinnamon. Stir to combine. In a second bowl, melt the butter. Spray a 10-inch bundt pan with cooking spray. Punch dough down very gently to release the gasses to release. Then remove small amounts of dough to form into about 1-inch balls. 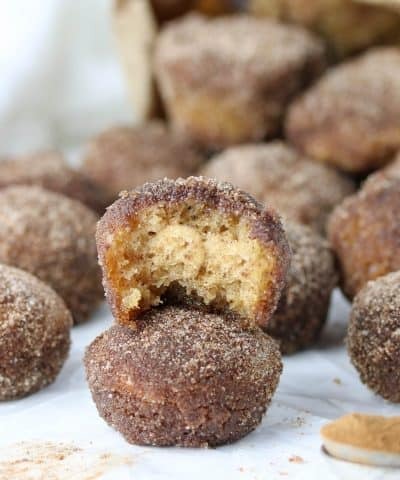 Dip each ball of dough into melted butter first, then roll into the brown sugar- cinnamon mixture. Place each ball of dough into the prepared pan arranging them as you go. You will get about 30 balls of dough. You may still see some of the bottom of the bundt pan in the end, but these will double in size. Once you have used all the dough, then cover the pan with a towel and allow to rise for another 45 minutes in a warm draft free place. Pre-heat the oven to 350oF. Combine the rest of the brown sugar/cinnamon mixture and butter. You may need to re-melt the butter. Then pour the mixture over the monkey bread before baking. Bake in your pre-heated oven on the middle rack for 30-35 minutes. Insert a digital thermometer into the center. The internal temperature should read 190oF. 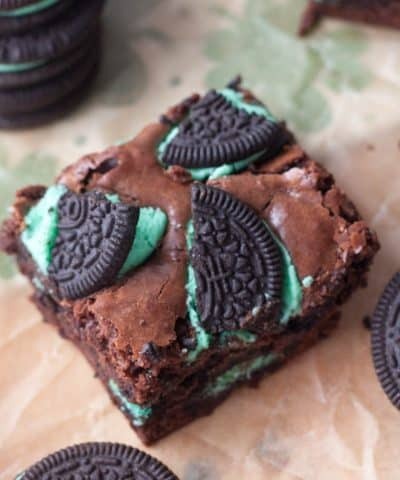 Allow to cool in the pan for 5 minutes, before inverting onto a plate. 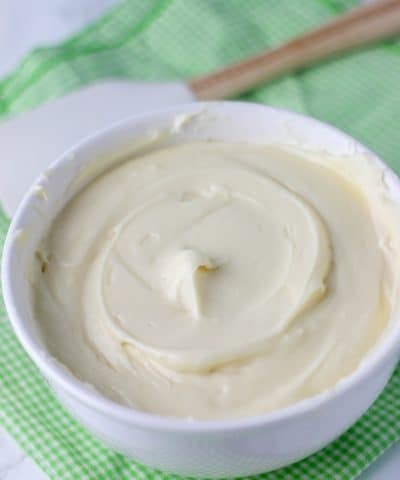 To make the glaze: In a bowl, whisk together the powdered sugar, milk and vanilla. Drizzle over the monkey bread and serve while warm. This monkey bread is best served warm. But it can be kept at room temperature, covered, for up to 3 days or in the refrigerator. You can also make the dough and refrigerate it overnight before allowing it to go through the first rise. Then continue on with the rest of the recipe as followed!